West Fife Woodland Walks, have just officially opened their paths to the public. 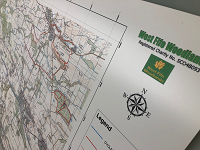 Our mapping & copyshop provided mapping, cartography and printing to help them erect their new “you are here” location signpost illustrating the paths. The paths cover from the west of Dunfermline to Kincardine and are maintained by the charity group. 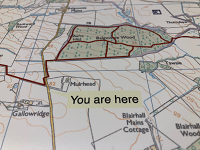 This entry was posted in News and tagged cad, cartography, dunfermline, editing, gis, mapping, maps, materials, os, paths, printing, repro, routes, scotland, sign post, uk, walks. Bookmark the permalink.